For boys of all ages, Cat® toys are a wonderful holiday gift idea….check out some of these great ideas and be sure to visit the Caterpillar website at shopcaterpillar.com! All of my children, but especially my four year old son loves to play with their construction sets. His favorite construction toys are the CAT® playsets because these toys are so realistic compared to real life CAT® construction vehicles. They play for over an hour at a time with the CAT® Shipping Port playset which includes realistic sounds just like the actual vehicles, music and phrases such as “load ‘em up and move ‘em out” and “let’s get to work.” The CAT® Shipping Port playset includes 18 pieces that are easy to put together and it is designed to be very durable withstanding lots of play with children ages 3 and up. There is a “free-wheeling Cat machine, working gantry, container cranes and a freight ship.” My sons love loading up the vehicles and driving it around the shipping port. 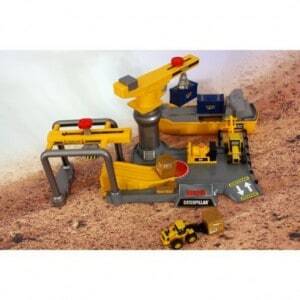 The CAT® Shipping Port Playset (SRP $20.99) is sure to be a hit with young construction fans and is a wonderful, affordable holiday gift idea. It is available for purchase at nationwide retailers including Target stores and Target.com and can be combined with other CAT® Playsets. CAT® Flashlight & Night Light-Preschool Toys! My four and six year old sons no longer have a fear the dark with the CAT® Flashlight & Night Light in hand. 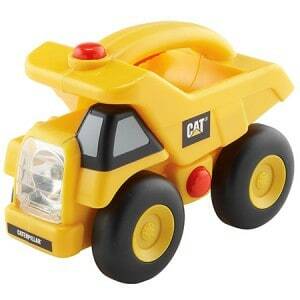 This unique and fun toy for preschool age children (18+ months) is designed to look just like a CAT® Machine. It is also functional as an actual working flashlight that is very easy for little hands to maneuver by gently squeezing the handle. My favorite feature is that when the handle is not being pressed, the light automatically goes off so it saves on battery life when not in use. It even has realistic sounds i.e. a honking horn for additional fun! At night, I set the timer on the night light and the under glow light is very soothing for my boys who are still afraid of being alone in the dark. The CAT® Flashlight & Night Life is a wonderful gift idea for preschoolers and young children who are transitioning to a new bed alone or simply love to play with fun construction toys. This toy is also affordably priced with a SRP of $19.99 at Caterpillar.com and can also be purchased at Toys R Us, Target, Walmart and Kmart for the holiday season. My boys love CAT , thanks for the review.